Golf games are something to brag about when played on a Sunriver property golf course. At the Sunriver Resort four state of the art courses provide stimulating and diversified play. The Sunriver Resort strives to present only the highest quality of amenities from dining to spa treatments and accomodations. The golf courses keep true to form impressing one and all that step foot on the grounds. Rivers run through it on the Crosswater Course. Sensational scenery sets the stage for this critically acclaimed course. Declared as one of “America’s 100 Greatest Courses” by Golf Digest this Bob Cupp designed course aims to please. The Little Deschutes and Deschutes Rivers flow through the landscape surrounded by acres of woodlands and preserved wetlands. Each hole has a variety of tee placements making play perfect for all levels of athletes. Beloved by locals the Meadows Course is set against the great Sun River. Stunning views of Mt. Bachelor provide inspiration and encourage great shots on the Par 72 course. Designed by renowned architect John Fought the Meadows showcases Ponderosa and Lodgepole Pines. Several championships have been played here in style including the NCAA Mens Division I Championship Tournament. A nine hole putting course is also onsite at the Meadows Course which is great for a quick practice round. Deep bunkers, water features and lava rock outcroppings are characteristics of the championship Woodlands Course. Top rated in the state, golfers from across the country venture to this part of the Sunriver property. Expertly crafted by Robert Trent Jones, Jr., a Par 72 layout is creatively designed. State of the art equipment is available in the Woodlands Pro Shop with experts standing by to lend an ear and offer advice. Caldera Links is the perfect place on the grounds to get in the game. Nine holes welcome even those who are new to the sport. Also designed by Bob Cupp, this little course offers up fine bouts of play. Newcomers can learn all about the fundamentals of golf in the Golf Academy. PGA caliber tuteredge is presented with private or group lessons. Youngsters can get in the swing of things also with junior programs. 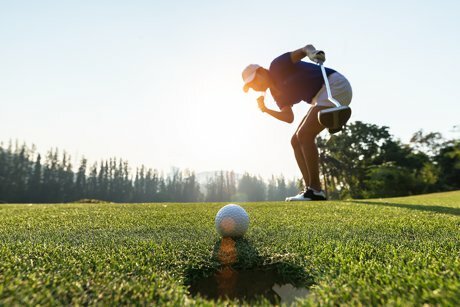 Residents living in Sunriver homes enjoy all of the perks of the Sunriver Resort in addition to the great golf courses. Stop in and see what it's all about.